MBSC Internship with Sam Leahey: Week#1 of 14 Hour Work Days! Along a similar note to last week’s blog/mini-article/entry/whatever is the notion of knowing how to be a better coach in the real world. Last time I discussed the time management factor. This week another coaching epiphany stirred my thinking. Specifically, prioritizing which coaching cues should be communicated first based on the level of competency or proficiency of the athlete(s) you are coaching. This is one of the many coaching revelations I’ve stumbled on this week.
. . . and I say, if you want to know how to coach, then get a group together and coach’em up! While that’s not all there is to it, it’s a great starting point. Typically when you or I think of squatting, jumping, landing, sprinting, or bench press technique, we think in terms of ideal. The picture we have in our heads is flawless and demonstrates perfection. That’s a good thing and something that should always be kept in mind. However, when working with the young and/or inexperienced athlete/client I realize now there needs to be a dichotomy of thought in which you know the ideal yet on the other hand know how to progress to that perfection rather than just throw everything at them at once. I’m finding that this progression should be based on where the person is now and what he or she is showing me at the moment. For example, show the beginner how to pick up and place the bar down with a flat back before you start worrying about using the hook grip for cleans! Extreme example but it gets my point across. The funny thing is, I would walk up on an athlete half way through her front squat set, notice her valgus frontal plane collapse first and immediately want to begin reactive neuromuscular training techniques. Only to look up and find she’s supporting the bar almost entirely with her arm strength instead of racking the bar comfortably on her shoulders during the decent. The bar wasn’t even touching her shoulders! Give her a little bit of “HIIT Coaching” now the next set she’s not all tensed up and wobbling all over the place worrying about the bar in her hands because her elbows are up and the bar is supported nicely on her shoulders. Guess what!?!? The knees went out naturally the next set, viola! I didn’t even have to mention it because she was nice and comfortable and the knees could “relax” during the decent a bit therefore going out automatically. It’s small things like this that make me think of the big picture of coaching. Another example, the very first time I had a group of kids this is how I instructed them on performing the cook hip lift. . . Very quickly I realized that with about 6 coaching cues (and even more with other exercises) people have no clue what to do even though you just explained it thoroughly. The first time every kid in my group just looked at each other waiting to see what the other would do. This was HUGE lesson for me. After noticing they neither had the attention span nor understanding of my coaching cues I called upon one of the big timers here at MBSC, Dan Gableman. Dan the man. . . he’s kind of “a big deal” at MBSC if you know what I mean. So with that in mind I re-grouped and attacked it again, stripping everything down to the bare essentials. . .
MUCH less talking. . . Guess what? With this coaching cue progression, I didn’t see anyone looking around at each other wondering what to do. They all were easily able to follow along. Most importantly, the final product was a quality Cook hip lift by the end of the set because I progressively gave them coaching cues during the set. Every day I try to find better ways to do things and every day the exact words I use change. Continuing on, I was working with a group filled with high school athletes and a few college guys who had trained at MBSC once before. I figured they could handle more verbage so I gave it to them. . .
Too Much Talking again: Not good for a group of kids. . .
Of course, as it turned out we still had people stepping all over the place and looking like they just got tripped up or knocked over. So I went to the dummy proof version. . .
And viola again! Everyone did it right! No problems what so ever because it was much easier to follow. I could post videos all day about ways I’ve learned to progress to ideal form and technique in exercises like the rear-foot elevated Squat or trap bar deadlift but I think these basic examples get the point across, and besides, it’s only week 1! All in all what I’ve discovered is that at times, and by that I mean most times, I was more worried about their left toenail being externally rotated too much, causing and inefficient force transfer up their deep longitudinal system and into the posterior oblique system, leading to dysfunctional energy leaks up the kinetic chain and thus right earlobe overcompensation. Too bad the kid is only 12 and just needs to know how to correctly pick up and put down a barbell first, HA! A lot of this may seem simple and common sense but for some reason these things resonate with me. Hopefully it makes you think more about the way you coach too. First up this week is part two of the article from Jennifer Lewis of Athletes’ Performance Understanding Chronic Knee Pain Part 2- The “What”. Next up is part 1 of Conditioning for Soccer from Renato Capobianco. Renato has been both a soccer coach at the highest level and a strength and conditioning coach so he brings a unique perspective. Last up is a sample three day program we use at Mike Boyle Strength and Conditioning. Hopefully this will provide some forum dialogue. This week’s video is former BU captain Brian McGuirk performing another 1 leg squat variation with 70 lbs. We have experimented quite a bit with ways to get proper depth in one one leg squats and this method worked quite well. The vest is 40 and the dumbbells are 15 ea. Also make sure you check out www.strengthandconditioningwebinars.com This is another great educational vehicle that Anthony Renna of the Strength Coach Podcast is developing. Anthony has archived webinars on the site so you learn any time day or night without ever leaving your house. Last week I recorded Understanding Sports Hernia for the site. Would you like to learn a little bit more about training for the NFL Combine? Take a look at another great interview from Stack Magazine and Stack TV. NFL Combine Training. What if I told you that for a whole week Mike Boyle would give you a mini-seminar everyday! Well as an MBSC intern that’s exactly what you get. 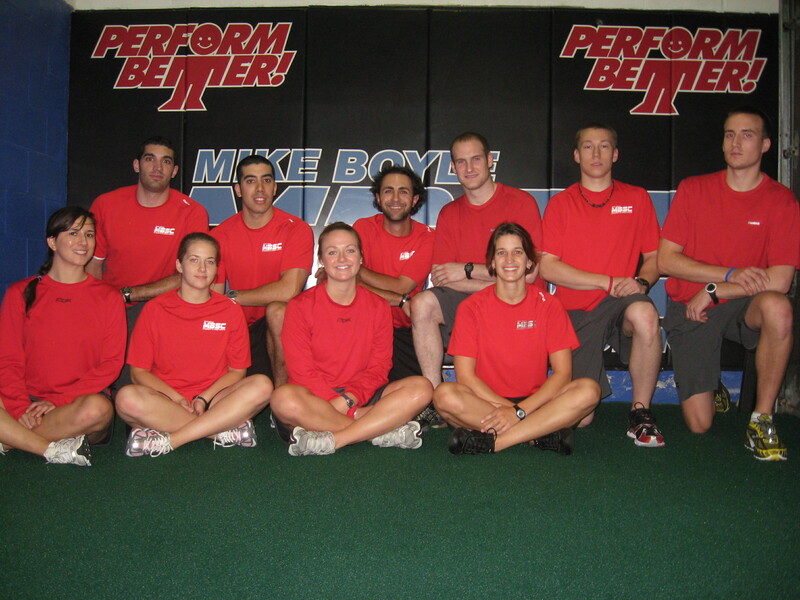 A one and a half hour hands on practical with Mike Boyle the entire week. How cool is that! The time was very informative and we got inside the mind of Coach Boyle, learning the nuances of his program and why things are done the way they are. For me, I think that week saved us all allot of money as well. Much of what we learned was a collection of various topics that Coach Boyle has made into DVD’s or addressed at previous seminars. So all in all we were learning new things and saving money at the same time – two plusses for this broke college student! The week was full of new thought processes for coaching but I’ll address the most practical take home point from this week. We all know those people who have an answer for everything. They know all the facts, concepts, principles, details, and latest research yet when you ask them to apply it in a practical real world setting their dumb as a post, especially when dealing with a group of people. The same is true for strength & conditioning coaches (performance enhancement specialists if you’re 25 years old or under). Many people are well read and can talk about training concepts until the cows come home however when in front of a group a whole new set of factors should run through your mind. For me, the “time factor” was almost none existent in my coaching. I could tell you all about the exercise/workout itself but if you only gave me 55 minutes to get everything in, I would fail miserably because I talk too much. I found myself trying to explain the “whys” of everything to the athletes. Athletes Performance solves this problem by allotting a small block of time each day to educate the athlete/client and empower them with the “whys” of their training; however it’s done at the END of the workout, not during. I think that is the best solution. If you only have an hour for training you really have to get things moving quickly and keep the down time to a minimum. you can see how if I am in charge of the group and attempt to give them a summary of trigger point therapy during the first part we might back up the whole workout, which means the group before them is waiting to use the same equipment and I won’t be ready to coach the group after them because I’m still working with the same group. If your business model is similar to MBSC (group training running nearly every 15 minutes) then a big part of your success is each group flowing smoothly from open to close without any traffic jams or hold ups during the day. I’m not aware of any other training facility (that actually gets results!) who is as efficient with their time as MBSC. From beginning to end it’s a constant flow of performance enhancement training with no time wasting. So how is this all applied? How do you coach groups or individuals efficiently without taking forever? Since it’s only been a week so far my answer is still tentative. For starters I decided to let go of explaining all the “why’s” of things and focus on actually getting them into proper position and moving correctly. I’ll save the education part for the end of the workout or I’ll give them a one to two sentence answer if they do ask during the workout “why are we doing this or that”. But in general I see coaching now kind of like HIIT: Short bursts of high intensity coaching followed by a period of “get the heck outta my face and let me do it now”. This has become my slogan for the summer. Give the athlete great coaching cues that really get the point across then back up and assess (aka let them work on getting strong without you talking to them the whole set). There are definitely exceptions however like “squeeze your glutes, chest up, knees out, pinch my fingers with. . ., etc.” that you tell athlete to do as he is doing the set, but in general I find the “HIIT Coaching Method” to work pretty well and it keeps the workout flowing smoothly and on time! Mainly, you don’t want a case of paralysis by analysis happening, and that’s just what you’ll get if you don’t employ the HIIT Coaching Method. As a matter of fact, that sounds like a good e-book title after I get my 10,000 hours of “experience” in, because everyone knows you can produce a training product until you get those sacred 10,000 hours in. Take Home Point: With only 1 hour you don’t have time for a Lecture or Hands-on-Seminar during the workout! Now if you’re just hanging out at the MBSC intern house and you do have all the time in the world with no rush then you can get into deep stuff and talk about them as much as you want . . . I wanted to focus this week’s blog post on the “outer unit” side this time factor concept. Next week’s installment will be focused on the “inner unit” with much more attention to the details, specifically about coach cue progressions and how to maximize your groups ability to do things the way you want them too. P.S. Here are a couple shots of the Winchester intern group. . . This week we have a mixed bag of articles. First up is an article by Daniel Martinez called Principles of Volleyball Performance Training Part 1- Organization. Daniel is a brilliant young coach and frequent forum contributor. This is a very detailed look at the preparation process in general with particular emphasis on volleyball preparation. I would strongly recommend you read this article even if you don’t deal with volleyball. Much like Dewey Neilsen’s previous MMA article, this is just good stuff and the title might cause you to skip over it. Next up is an article from Jennifer Lewis of Athletes’ Performance called Understanding Chronic Knee Pain Part 1- The “Why”. Jennifer has been kind enough to let me reprint these. This is a great overview article. Don’t miss it. Part 2 will run in two weeks. Last up is a Sample Twelve Week Conditioning Program. The Jing screen capture program allows me to transfer Excel files to Word documents easily. A recent forum post about “finishers” got us around to things like volume and progression so, I thought I would post what I am currently doing with some of my athletes. Bonus Article– In addition, we have a bonus article for the hockey strength coaches on the site. On-Ice Multi Directional Intervals for Hockey by Maria Mountain demos a great on-ice drill that combines the physical and mental aspects of the game. Video of the week is another longer look at the Rear Foot Elevated Split Squat. As I have ranted about over and over, this is not a Bulgarian Lunge. It is neither Bulgarian, nor a lunge. However, I think this lift might be the future of our lower body training. It is extremely evident to me, as last week’s video showed, that my athletes can exceed fifty percent of their 1 RM in this lift. What this shows me is the limiting factor in squatting is the back, not the legs. Also make sure you check out www.strengthandconditioningwebinars.com We will be doing Understanding Sports Hernia Tuesday at 8 PM EST. To get your strengthcoach.com member discount you need to sign up by Monday. The webinars are archived so even if you plan to view it later make sure to sign up by Monday. My friends at Stack Magazine and Stack TV got some great footage when they came in to film our NFL prospects. Check out this portion of an interview on becoming how I ended up a strength and conditioning coach . I pushed two articles to this week from last week so I could run Handicapping the Perform Better Summit in Chicago last week. If you’ve been on the site, you may have already read Hypertrophy Training for Athletes . This one will make you think. Take a second and read it. I also pushed Rob Panariello’s A Simple Drill for the Enhancement of the Athletic Reaction Time, Foot, and Hand Speed article to this week. 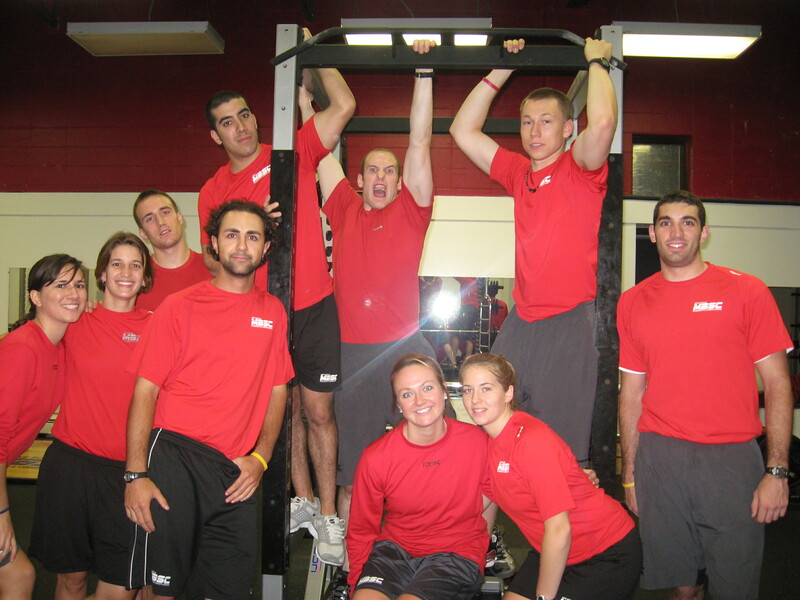 In addition I have a great article about my experience with TRX Training, A TRX Ah-Ha Moment. Tomorrow I’m going to begin to post some great video we shot at MBSC for Stack Magazine. Tomorrows clip is an interview with me about becoming a strength coach. Video of the week is one you may have seen already on the forum. The video shows former BU Terrier Colin Wilson doing a set of Rear Foot Elevated Split Squats with 225 lbs. This is a great example of how strong you can get on one leg. Also make sure you check out www.strengthandconditioningwebinars.com . We will be doing Understanding Sports hernia next Tuesday at 8 PM EST next week.